Paddington Bear may have travelled across the ocean from deepest, darkest Peru in order to end up at Paddington Station, before meeting the Brown family. Although travelling to East Anglia isn’t quite the same journey (although can feel just as long when you’re on the A47), the Boo Roo and Tigger Too family welcomed our very own special guest into our home. 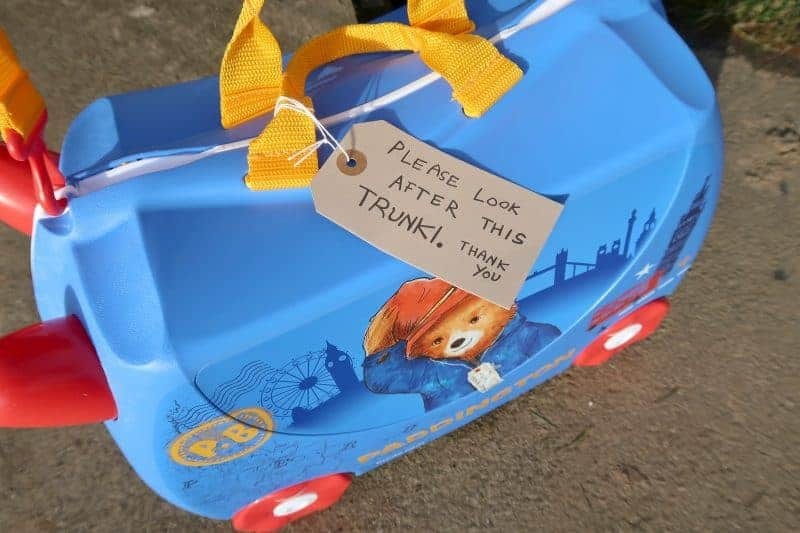 The Paddington Bear Trunki, complete with an extra special ‘Please look after this Trunki – Thank you‘ label – which the children adored. Designed for travelling tots – so, grab your duffle coat and red wellington boots and ride off with your Paddington Trunki to the capital! When it comes to taking day trips and travelling as a family we try to grab every opportunity as possible. Whether we are heading to a firm favourite such as Thomas Land or one of the many Merlin Attractions. With three children in tow, there is always the need for careful packing. Especially as there is usually only Mr Boo and me to carry it along on the other end of our journey. Trunki eases this problem in a number of ways. Firstly, by producing funky designs just like the new Paddington Bear Trunki that encourage children to show an interest in their luggage. Secondly, (and probably the best feature) a Trunki is a ride on luggage solution, perfect for whizzing around the airport, hotel room or along the station platform. Enabling children to either pull their Trunki along or hop onboard and scoot along. Thirdly, the ample space available inside, enabling parents to pack all the essentials, as well as a few extras ‘just in case’. Both Roo and Tigger have had Trunki’s since they were younger and have made full use of them on overnight stays at friends and families houses. Family trips away to theme packs etc. The available space inside is perfect for housing clothes, comfort blankets as well as toys and activities to keep entertained on trips away. 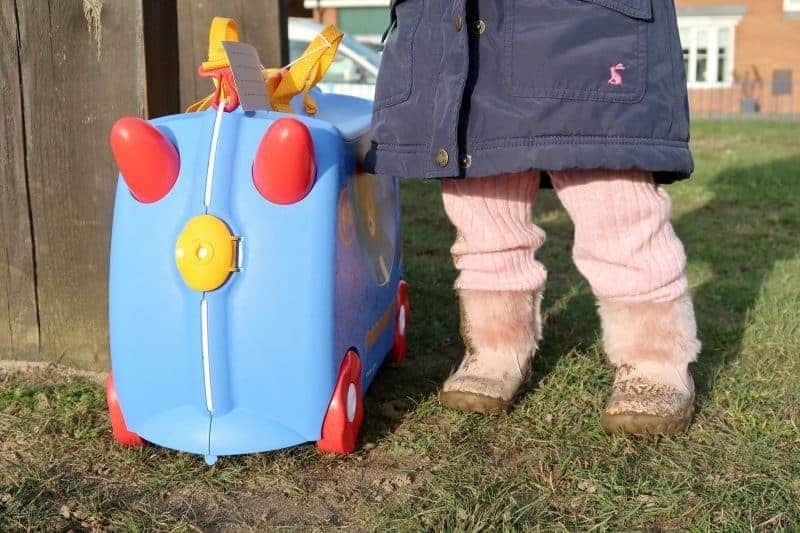 To some, the Trunki may look like a suitcase, or it may be used as a toy box. It may be sat upon and wheeled along the floor, our new Paddington Trunki is that and so much more. To Piglet, it is a friend, a companion, a playmate. She has taken Paddington under her wing and dare I say leading him astray with some of her antics. Utilising it in the boot of the car to house extra clothing, nappies and snacks when we have been on day trips. Seeing how many toys we can squeeze inside before we head off to see family. As well as an emergency picnic hamper when we made an impromptu visit to the seaside to walk along the sand dunes and blow the cobwebs away. A Trunki is not just a suitcase, it is so much more. 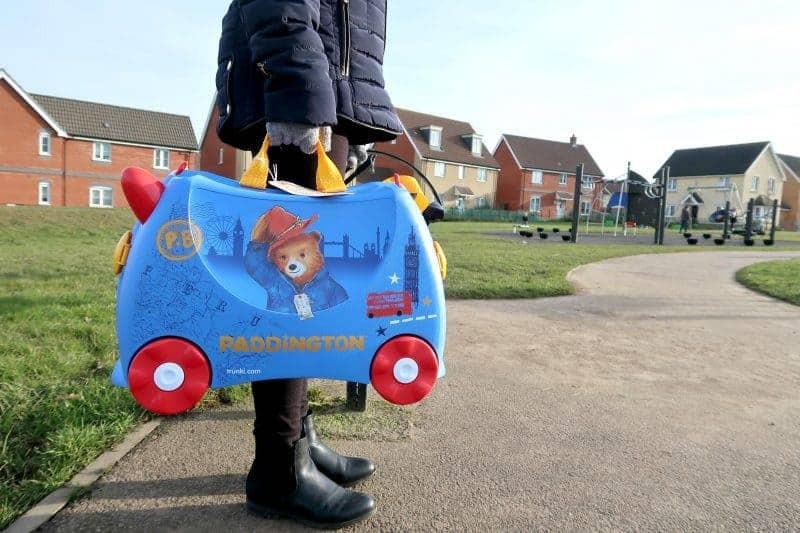 Paddington Bear Trunki // Where Can I Buy One? The Paddington Bear Trunki is available to purchase directly from Trunki. Currently priced at £44.99 with free delivery. Boo Roo and Tigger Too are passing the baton over to another family to ‘Please look after this Trunki‘ with a Paddington Bear Trunki to giveaway. I pack all my little grandsons teddies and toy dinosaurs. First would have to be Marmalade sarnies. then his little teddy as he will not sleep without it then his pad so he can watch his cartoons and mum and dad can get a little peace! Well my little boy would pack his bear and his favourite books and clean pants! Favourite clothes, books and floor puzzles. knowing my daughter, she would pack all of her dolls and dolls clothes, not taking a thought about clothes for herself! Books, toys, puzzles and marmalade sandwiches. Favourite cuddly Padding Bear, colouring book and pencils, snacks and clean underwear! My little girl would fill it with all her craft stuff and lots of snacks! I would pack marmalade sandwiches of course….oh, and a good hat ! We’d pack a map, binoculars, a compass & marmalade sandwiches and go exploring darkest Peru. Teddy which goes every where with us, and no doubt as many of his toys he can fit in. Sandwiches, water bottle and Paddington Toy! My little boy would try and pack every toy he owns into this case. Forget clothes! My grandson just knows what he likes with him. Clothes and toys, no marmalade sarnies though! Clothes, books, puzzles and toys, and some chocolate! I would pack my son a little picnic packed lunch, colouring in book and crayons, his stuffed dinosaur and some spare clothes. Oh and binoculars for an adventure! My Grandson would pack clothes, lego, jam sandwiches & some colouring books. Paddington teddy and some books. A jigsaw puzzle, A teddy, A book and some sweets. My daughter would pack her teddy bear & Elsa dress for our holiday to Portugal! My son’s little multi coloured monkey. Snack Bars, chocolate buttons to share, a comfy change of clothes for little one. A bottle of water, a favourite toy, and of course, marmalade sandwiches! Marmalade sandwiches? They go under Paddingtons hat! This is absolutely gorgeous! Want it for my nephew. My little boy would want a teddy and lots of snacks. Lots of games, sweets and other snacks. Definitely don’t forget the marmalade sandwiches. Books, Paddington Bear and Marmalade sandwiches! My daughter loves Paddington and she would packs her snacks, books to read and colouring pencils and a sketch pad. Sandwiches in case of emergency and toys to keep us busy and a few clothes! Books, toys, snacks, a blue mac and a red hat in case it rains. Marmalade sandwiches, first & foremost. Pencils & paper to write that important, please look after this bear note. Toiletries & toothbrush to keep clean en-route. I would give it to my Grandson so he could use it when he visits for overnight stays. He always brings some bedtime books and lots of cars so this is what we would use it for. Marmalade sandwiches for a picnic! My great-niece’s shorts, t-shirts, swimming costume, a couple of teddies and some crisps. Sandwiches, wellies and some Paddington books. Lots of yummy treats to eat! Clothes, books and colouring materials. Marmalade sandwiches, my little girl has a little corduroy dress with Paddington in the pocket so would have to pack that and her Paddington teddy. Lunch and a bottle of water! Snacks, cup, little trucks and cars, teddy bunny. I would try and get sensible clothes in there, but I think it would end up being mostly toys. My little Hamish would love this! He would pack it with his wellies, his favourite hat and fire engine. Lots of snacks and treats. Marmalade sandwiches ( obviously! ) A map of the London Underground and a hat!!! Some Lego, colouring books and food! Marmalade sandwiches and plenty of books. My granddaughter would pack her favourite stuffed toys, some snacks and maybe some clothes. Her mummy would have to pack a sponge bag for her. I’d pack as much as possible for an “exciting adventure” to keep my young grandchildren happy … snacks, drinks, books, crayons etc, a small cuddly toy each, their tablets (sigh…. a sign of the times!) … wellies, wipes and a change of clothing (for messy kids) and most important “treasure bags” for collecting ‘rare’ finds (e.g. feathers, pine cones, shells etc), plus I’d pack my camera to capture those precious moments (photos for my scrapbook). Makes me want to go on an adventure right now – I need to start planning one!